Yellow Turban Revolt (184-205) - After its restoration and change of capital to Luoyang, the Han Dynasty had been revitalized...for a time. But by the end of the 2nd century, it had once again become very weak. The Chinese economy was poor and the imperial government responded by imposing oppressive tax levies to try and keep its treasury funded. This created the adverse effect of weakening the economy further still. As a result, a mass migration of peasant farmers from north to south began. The land was more fertile in the south and the north had been plagued by flooding along the Yellow River. At the same time, the Han government was losing its ability to maintain order. A feudal society was developing wherein local land owners were able to exert greater influence over the people without interference from central authority. They exploited this influx of workers by having them work the land for very low wages. The divide between wealthy and poor was at an all-time high. Back in Luoyang, the Han Dynasty had become so weak that the court eunuchs banded together and created their own little sphere of influence. The ten most powerful had become known as the Ten Attendants. All this was a recipe for rebellion. As in previous dynasties, the Han was perceived as losing its Mandate of Heaven. Because of the dire situation of so many peasants, some of whom where former soldiers, under the right circumstances, it would not be difficult to convert them into an army. And those circumstances came in the form of three brothers, known as the Zhang. Zhang Jue was the leader, but Zhang Bao and Zhang Liang helped launch the uprising. It became known as the Yellow Turban Revolt (or Rebellion) because its members wore yellow scarves on their heads. However, what is not indicated by its name is that at its heart, it was a Taoist movement (at least initially); the Zhang brothers were all devout Taoists. They established a sect, named Tàipíng Dào (which means Way of Great Peace), in the Chinese province of Shanding, which remains the heart of Taoism to the present-day. History records that the brothers were sorcerers, and possessed healing powers, which is likely the result of them attaining a certain mythical status with time. The primary source for this period is the Records of the Three Kingdoms by historian Chen Shou (233-297). It also is the basis for a historical novel written some 1100 years later called Romance of the Three Kingdoms by Luo Guanzhong. This era is considered one of the most romantic in China's history and has been the subject of numerous books; but Romance of the Three Kingdoms is considered amongst China's greatest works of literature. And it's possible that the Zhangs' perceived powers were derived from this work. For instance, in Guanzhong's novel, Zhang Bao is able to summon a thunderstorm from which an army of apparitions of dark warriors emerges. The rebels fought the Han on three fronts. Furthermore, they had agents in the imperial court; some of whom may have been members of the Ten Attendants. The Han emperor at this time was Ling. He caught wind of the planned rebellion and sought to root out the traitors in the capital by executing about 1000 people. He also dispatched his army to the three known locations from which the rebels were preparing their attack. The Han army was under the command of He Jin, who was the half-brother of the emperor's wife, Empress He. This forced Zhang Jue to launch his rebellion sooner than expected. The fighting broke out in early 184. The Zhang brothers all took titles. Zhang Jue became known as "General of Heaven", Zhang Bao was "General of Earth" and Zhang Liang "General of Man". Despite initial success, the rebellion was outmatched, particularly in weaponry. It took a year, but the empire finally crushed the rebellion. 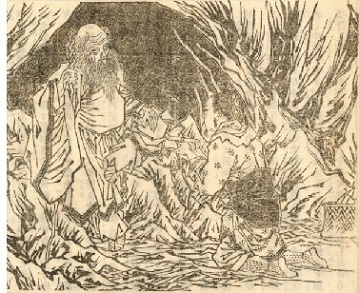 All three Zhang brothers fell in battle. However, while the initial rebellion was quelled, it exposed the weaknesses within the Han Dynasty. A couple months later, another rebellion broke out, and more after that. With each successive rebellion, the government found it increasingly difficult to put them down. When Emperor Ling died in 189, a power struggle ensued between He Jin and the court eunuchs, resulting in Jin's assassination. One of his allies, Yuan Shao, responded by burning down the palace killing all the eunuchs. After that, a warlord named Dong Zhou seized control...until he was murdered in 192. This bloodshed paved the way for Cao Cao's rise to power. But before he could, he was opposed by He Jin's ally, Yuan Shao. They fought at the Battle of Guandu in 200. Cao Cao was victorious and became the last ruler of a dying Han Empire. Although his line survived as one of the kingdoms which arose out of the Han in the time known as the Three Kingdoms Period.